This tab allows other configuration options, as listed below. Select this option to enable the name service cache daemon (nscd) and configure it to start at boot time. The nscd package must be installed for this option to work. For more information about nscd, refer to its man page using the command man nscd. Select this option to store passwords in shadow password format in the /etc/shadow file instead of /etc/passwd. 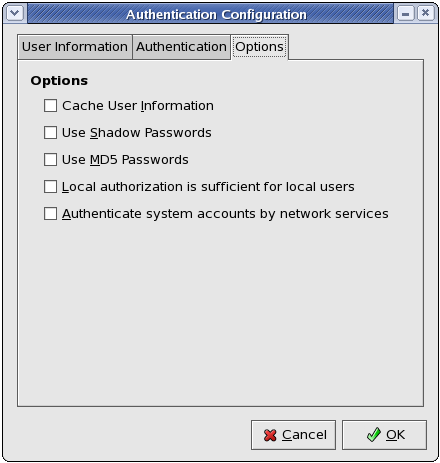 Shadow passwords are enabled by default during installation and are highly recommended to increase the security of the system. The shadow-utils package must be installed for this option to work. For more information about shadow passwords, refer to Section 32.6, “Shadow Passwords”. Select this option to enable MD5 passwords, which allows passwords to be up to 256 characters instead of eight characters or less. It is selected by default during installation and is highly recommended for increased security. When this option is enabled, the system will not check authorization from network services (such as LDAP or Kerberos) for user accounts maintained in its /etc/passwd file. Enabling this option configures the system to allow network services (such as LDAP or Kerberos) to authenticate system accounts (including root) in the machine.